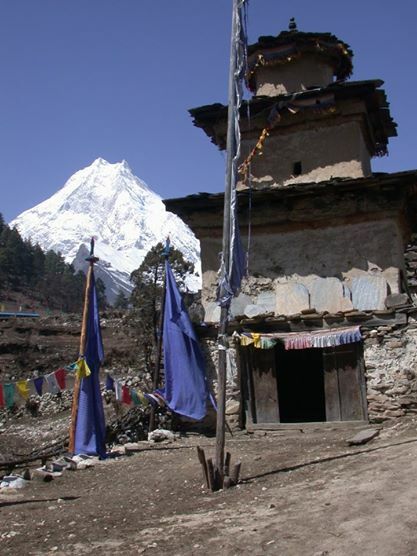 Begin the trek from the historic centre of Gorkha after a 6-7 hrs drive from Kathmandu . The trail heads up the valley of the Buri Gandaki River through wild and unexplored country inhabited mainly by members of the Gurung ethnic group. The trail circumvents interesting Manaslu peak [8156m.] crossing Larkya pass at 5100 meter and finally emerges onto the Marshyangdi river valley along the main trail of Annapurna circuit. You will have two options as where to conclude your trek. OPTION 1: continue descending along the Marshyangdi river valley through the rhododendron & oak forests and finally conclude the trek at Besi Sahar and Drive to Kathmandu . Any physically fit person can do this trip anytime from Mar to May [spring season] and Sept to Nov [autumn season]. OPTION 2: trek further to Jomsom at Kali Gandaki river valley crossing which is another high and arduous hike through Thorung la pass at 5416 meter and conclude the trek by flying down to Kathmandu via Pokhara, or you can also avoid a flight by walking down to Pokhara from Jomsom following the Annapurna trail in 4-5 Days. Along the way you will be rewarded with magnificent views of the Annapurna Massifs and Dhaulagiri peaks. Day 22 -Fly to Pokhara/Kathmandu.